Ballpark basics: A mini-Wrigleyville a short drive from Chicago. The South Bend Cubs make sure you know who their parent club is. Walking around Four Winds Field you get nods to their parent club a couple hours up the road. There is a newly constructed apartment complex behind the left field concourse that will have rooftop decks, the batters eye was adorned with (fake) ivy, and even the rooftop of the Cubs Den had a large Toyota advertisement across the roof, reminiscent of the old rooftop ads behind the left field wall at Wrigley (before the scoreboards covered them up). 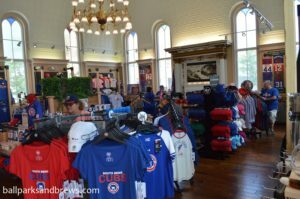 Speaking of the Cubs Den, this must be the nicest team stores in all of MiLB (if not all of baseball). Sitting behind the left field wall, the team renovated a former synagogue to house the Cubs Den. 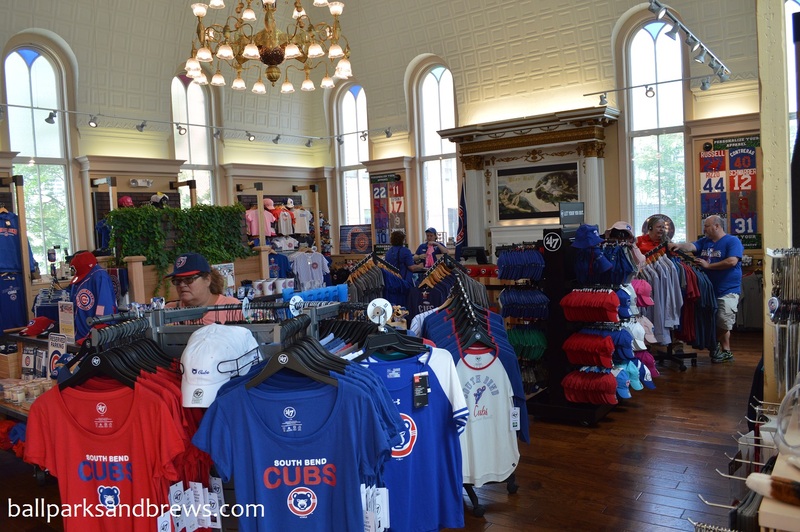 Along with t-shirts and hats adorning the SB Cubs logo you can gaze at the restored stained glass windows or enormous chandelier that hangs from the arched ceiling. The concourse allows you to walk around the entire ballpark. It is covered by high-arched ceilings that have been painted white to give it an airy feel. This is also the only the area that provides any shade and can get a bit crowded on hot days. Open air suites have been bricked in just behind the seating bowl which can obstruct some of the views. There is a picnic garden in the left field corner with multiple levels of picnic tables for large groups. A large berm is situated in the right field corner and gives another option for group seating. Best Spot for Beer: You have a couple options when looking for a decent beer at Four Winds Field. The Tiki Hut in left field offered the best selection while still being able to see the game (and the hut offered some shade as well). 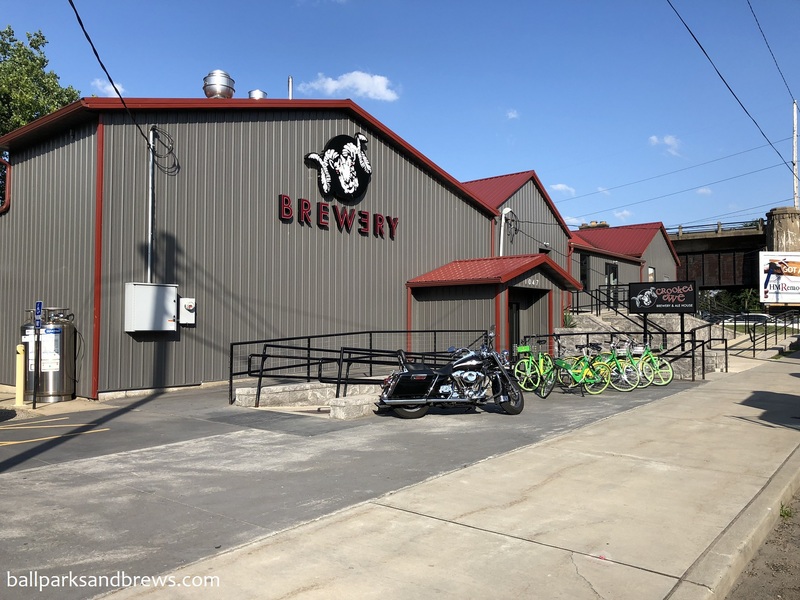 On the concourse near home plate there is the Round Barn, an offshoot of the Round Barn Winery and Brewery in Baroda, MI, with options from Round Barn Brewery, Bell’s Brewery, Dark Horse Brewing Co. and Three Floyds Brewing Co. There was also a cart along the third base side with multiple options specifically from Bell’s Brewery. 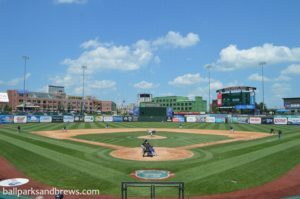 Four Winds Field is firmly in Cubs country and the team harnesses this energy to create a unique experience at the ballpark. 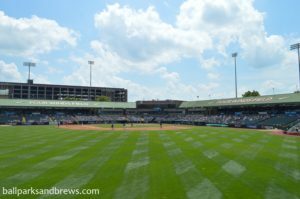 Being just a couple hours away from Chicago makes the South Bend Cubs a perfect team to visit for any Cubs fan. Brew Basics: A bright spot with (if you choose your seat wisely) river views. South Bend is hard to describe, blue collar one block, bougie Notre Dame the next. There are large patches of run down areas with nice, new areas interspersed. Likewise, Crooked Ewe – a busy street, lots of construction, mostly basic commercial businesses (car rentals, auto shops, factories) and then Crooked Ewe plopped right in between. Not wanting to drink then drive, we walked from our downtown hotel to the brewery, and while it was not a terribly far walk, there was no good way to get from here to there. We had to cut through office park parking lots, areas with busy traffic and no sidewalks, and planned to use a ride sharing app to get back weren’t sure the return walk in the dark would be safe. Walking up we couldn’t really identify the building between the road construction and various businesses lining the side of the road, but noticed a lot of people parking in a satellite lot as we got closer. Most everyone else had resorted to driving and so the decent sized Crooked Ewe lot was already jam packed. 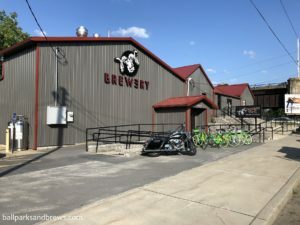 The brewery itself had family dining areas, an upstairs event space and even an outdoor smoking balcony, but the smart money is to sit at the bar. 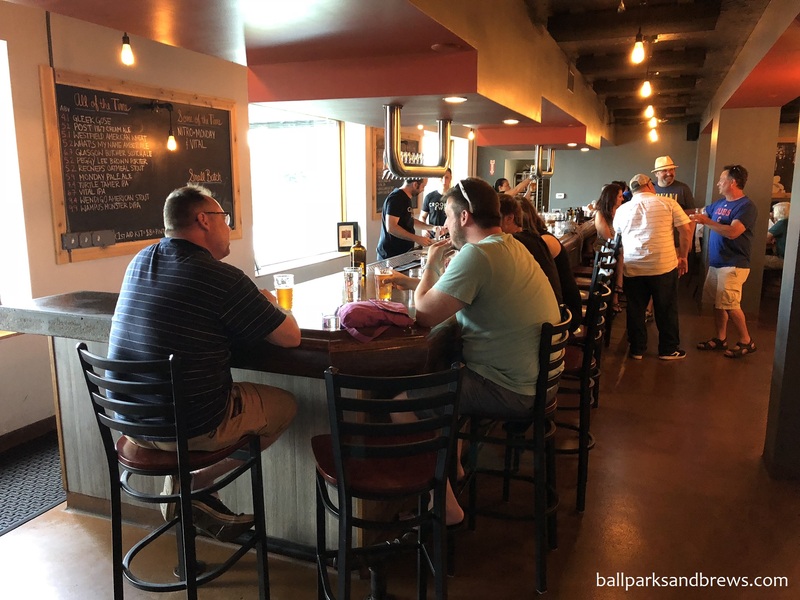 Crooked Ewe is right on the St. Joseph River, but the bartenders have their backs to it, and all of the dining areas are on a sunken floor and low so a bar stool is the only perch that gives you the great view. Crooked Ewe has good food, is popular with the locals, and therefore was loud. You can find Crooked Ewe in some local restaurants, but not in stores. They aren’t canning or bottling because they can’t keep up with current demand, but they will do a growler fill. 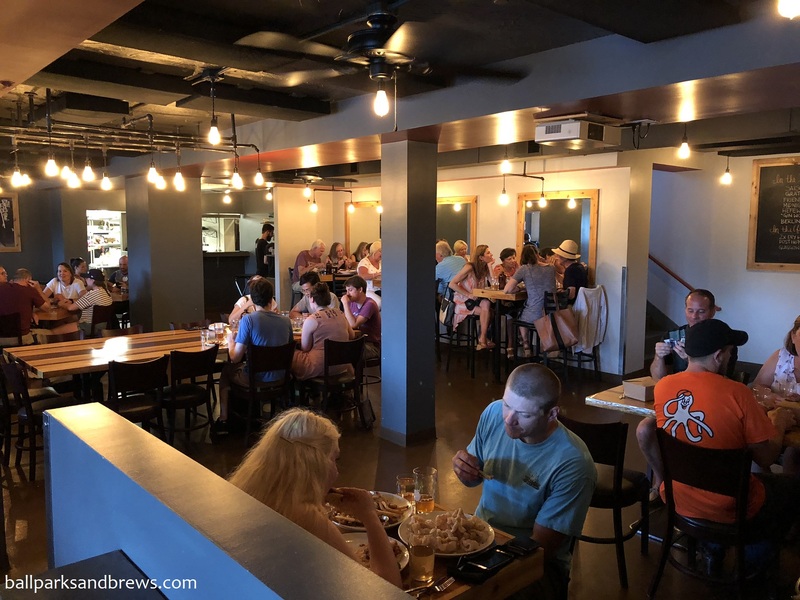 Their menu covers everything from the basic foods and beer offerings to a 1st Aid Kit (buying the kitchen a round) and the Kit and Boodle, which gives (a minimum of 2 people) every beer and two apps. 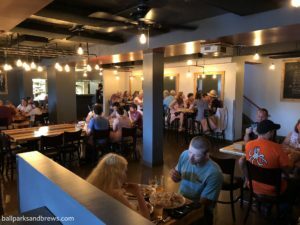 If you’re not up for every beer on tap, they also have flights, which are $8 or $11 depending on if you order the standard beers or the fancier ones. (Note on that, we were careful and stuck to the $8 list, but were still charged for the expensive flight and didn’t notice until we were walking out). Their beers all have meaning behind the names, but the bartenders knew many of them. Several are tributes to the dead, including Recneps named for Spencer, a childhood friend, Peggy Lee, the owner’s Mother in Law, and Vital named a friend Vitali, also deceased. There’s Monday – the best Monday you’ll ever have, Post 1167 a tribute to the building which used to be a VFW post and the What’s My Name Amber – where they just ran out of names. Monday Pale Ale 5.9 ABV/35 IBU – Bright banana yellow with lacing, but not much carbonation. This was one of two on Nitro taps that day. Fruity yet hoppy, with apple notes, but not like a cider. As it warmed the lacing never dissipated, but the citrus smell grew stronger. Vital IPA 6.7/64 – Golden peach color with only a faint aroma. Flavor is juicy, and ends tingly carbonated with a little grapefruit and an equal amount of hops. Glasgow Butcher Scotch Ale 6.7/26 – Ruby brown color, similar to a dark syrup. Smelled like saltines and caramel, and tasted like a dark fruit wine. There was currant in the body and finish which was dry like a wine and a little oat malted. Peggy Lee Brown Porter 5.2/28 – Dark coffee brown with amber tones. The smell was very light but still nutty and malted. The palate was a blend of several unique flavors including anise, peppercorn, spice and even some coffee grounds. We recommend letting this one warm up a little bit to let the brown sugar become more pronounced. Recneps Oatmeal Stout 5.2/30 – A full shade darker than the Peggy Lee, like a dark coffee. Smooth with vanilla notes, and still full bodied with a chocolate and coffee finish. Oat notes come through throughout and the bouquet is a light oat aroma with a bit of coffee undertone.